The dry root and rhizome of perennial trailing herbaceous plant Rubia cordifolia L. of family Rubiaceae. Anhui, Jiangsu, Shandong provinces in China. Light smell and bitter taste. Long and thick sticks, reddish brown peel with yellowish red cross section. Removed stems, soil and thin fibers, washed and dried in the sun; unprocessed or stir-baked. Bitter, cold; liver meridian entered. Cool blood, resolve blood stasis and stop bleeding, dredge meridians. This herb is bitter in flavor and cold in nature and good at moving in blood system. It can cool blood and stop bleeding as well as activate and promote blood circulation. So it is indicated for bleeding due to recklessly blood flow resulted from blood heat or blood stasis retention inside vessels, especially for various bleeding due to blood heat with blood stasis. It is used alone or combined with other hemostatics. For instance, it is combined with Ai Ye and Wu Mei in Qian Mei Wan From Ben Shi Fang (Experiential Prescriptions for Universal Relief). For metrorrhagia and metrostaxis due to blood heat, it is combined with heat-clearing and blood-cooling herbs such as Sheng Di, Ce Bai Ye and so on. For metrorrhagia and metrostaxis due to qi deficiency failing to control blood, it is combined with qi tonics. For instance it is combined with Huang Qi and Bai Zhu in Gu Chong Tang from Yi Xue Zhong Zhong Can Xi Lu. 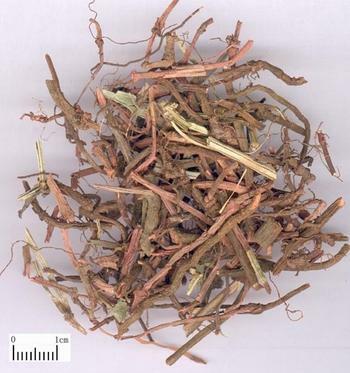 It can promote blood circulation and free vessels, resolve blood stasis and dredge meridians and collaterals, usually indicated for the syndrome of meridians and collaterals obstruction due to blood stasis, such as amenorrhea due to blood stasis, traumatic injury, and wind-damp arthralgia. It is commonly used in gynecology. For amenorrhea due to blood stagnation, it is used singly or combined with blood-moving and stasis-resolving herbs such as Tao Ren, and Hong Hua, etc. For traumatic injury, it is infused in alcohol or combined with blood-moving and pain-alleviating herbs such as San Qi, Ru Xiang, and Mo Yao, etc. For wind-damp arthralgia, it is used infused in alcohol and orally taken or combined with other herbs that can expel wind and dampness, relax tendons and activate collaterals. Decocted 10~15 g, maximum dosage is 30 g. It also can be used in pill or powder. For stopping bleeding, stir-bake it into charcoal; for activating blood and dredge meridians, use the unprocessed or stir-bake it with alcohol.